"Mom's original recipe with a little kick of wasabi mayonnaise to give this classic a more modern edge." Mix the wasabi mayonnaise, salad dressing, relish, mustard, garlic salt and pepper into the yolks. Spoon into the awaiting egg white halves. Sprinkle paprika over the top. Refrigerate until serving. 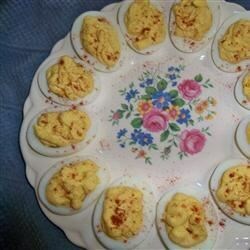 This was a new twist on deviled eggs and everyone liked the added flavor! I would make them again! I used regular mayo instead of wasabi, I didn't use relish since I don't like pickles :-) It was SO YUMMY!!! Didn't have wasabi mayo so I used horseradish (Less than a tablespoon). It was yummy!